When it comes to writing at home, serving in our church and community, and loving our family, we all strive for the same thing: balance. We believe it’s out there, and if we discover the right formula we’ll find it. And, when we find it, there we will have peace. As a wife, mom of six (soon to be 10! 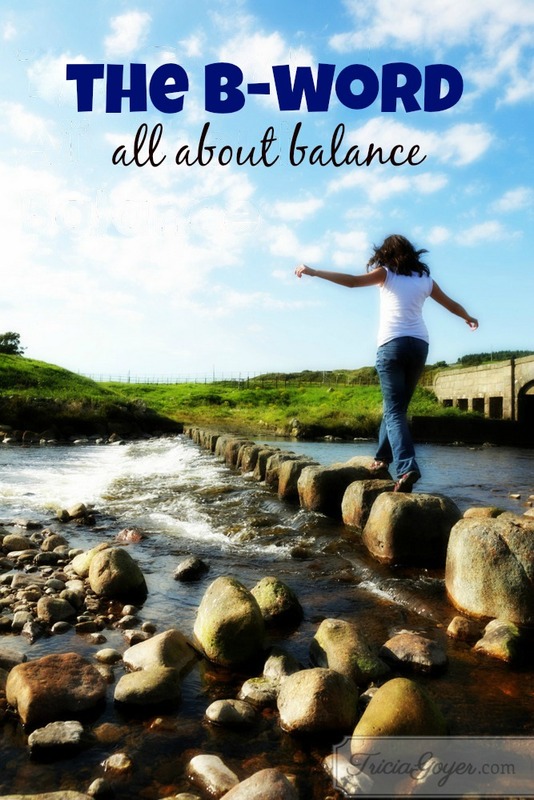 ), leader in a community support group, and full-time writer, radio host, and blogger I have the answer to the issue of “balance.” The answer is that balance is not possible . . . or at least not in the form of a perfect schedule or routine. For even if we find balance one day, it most likely will slip between your fingers the next. People have unique needs on a daily basis. Work schedules are dependent on others. Health wavers, moods change. Husbands have crises at work. The people we serve in the community have struggles often. Very often. The only thing we can be certain of is that as soon as we achieve a small measure of balance something is going to overturn the applecart and all our good intentions will spill out like crabapples, becoming scattered and bruised. The thing about balance is that the only one who can control tomorrow (or even the rest of today) is the One who can also provide for our moment-by-moment needs when our schedule gets out of whack. God not only knows what’s coming, but He also knows what we need to do today to prepare for it. Naps and bedtimes are a biggie for me. My little kids take a nap every day, at around the same time. And we strive to have them in bed by 7:30 p.m. We also try to have dinner as a family every night. Schedules give our children a sense of order. And when I know they’ll be in bed at a good hour, I can look forward to some element of peace in the evenings. I pick two to three important things to get done in each day. There are days I need to write 2,000 words. There are days I need to get caught up on laundry. These two things cannot happen on the same day. When I choose what to focus on some things, I’m also choosing what to ignore. This is important. There will never be enough time to do it all. Ever. I set aside times for fun and play. I give attention to my little ones first thing in the morning (instead of jumping straight onto the computer). I also try to spend an hour with them of dedicated time in the afternoons between the time they wake up from naps and the time I have to start working on dinner. We play in the yard, blow bubbles, or take a walk. When my kids know they’ll have dedicated time, they don’t have to fight for time (or act up to try to get it) throughout the day. I’ve managed my workload so I can have a young mom come in four hours a week to clean. I have an assistant who helps with my blogs and other online help. I have a friend/nanny who watches my little ones for blocks of time so I can write. I was not at this place ten years ago, but I’ve worked to find people who I can help financially and who can help me. While you may not be at the place to hire someone, ask yourself if there is there someone who you can trade with. For years I traded homeschool days with another mom so I’d have a free day. Also, when you see someone who is seemingly “doing it all,” know that that person probably has help, too. No one can do it all and balance everything well. No one. He has the answers for your day. His Spirit will guide you to what’s most important. God has good plans for you and your family. Instead of looking to find the perfect schedule—the perfect balance—look to God for His plan for your day. Take your eyes off of that printed up schedule, and put them on Him, and you will go far into having a healthy and happy family and a productive work life, too! Want to learn more? Check out Balanced!